The Michigan's men's hockey team has a pregame huddle. John U. Bacon for Friday, March 30. This season, Michigan’s men’s basketball team has enjoyed another great turnaround. After a bad loss to Northwestern in early February, the Wolverines were stuck in the middle of the Big Ten – not the station of Final Four teams. But they haven’t lost since, rattling off a 13-game winning streak. That’s how you get to the Final Four. 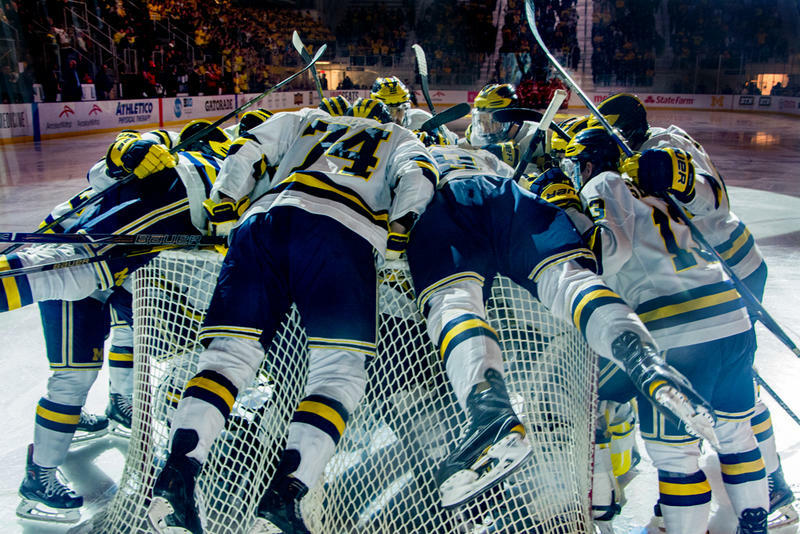 It’s a great story – so great, it has eclipsed another great story happening across the parking lot: Michigan’s hockey team has risen from mid-season mediocrity to make the other final four. Two years ago, during hockey coach Red Berenson’s 32nd year behind the bench, the Wolverines finished second in the Big Ten and returned to the NCAA tournament. It was a great capstone to a coaching career that included 21 league titles, a record 22-straight NCAA tournament appearances, and two national titles. He was ready to step down. But, because Warde Manuel had just become the school’s next athletic director, Manuel asked Berenson to coach one more year to give him time to search for Michigan’s next coach. Berenson agreed to take one for the team. After Michigan finished below .500 for only the second time in 30 years, Manuel named Mel Pearson to succeed Berenson. It wasn’t a tough call. Pearson had assisted Berenson for 23 years before returning to his alma mater, Michigan Tech, in 2011. In just a few years he turned around the Huskies, winning their first league title in 40 years. He was ready – and this year, at age 58, he got his chance. The first half of this season the players didn’t trust the coaches, and it showed. Michigan was mired in mediocrity. Pearson and his assistants weren’t afraid to bench players who weren’t performing and create some competition for ice time. But they were fair about it, which is the difference between motivation and mutiny. Bit by bit, the players bought in. Their turn-around started with two losses. Sounds crazy, but both losses were against second-ranked Notre Dame, by one goal, with the Wolverines outplaying the heavily favored Irish. The players could see Pearson’s approach was starting to work. They went on to sweep two ranked teams, followed by a bad weekend at Ohio State. “We got whooped,” Pearson said, which set up a come-to-Jesus meeting with the players. Either they were in, or they were out. They committed to jumping in, with both feet. Since then, the Wolverines have lost just two games, against ten wins. The run includes a sweep of top-ranked Notre Dame, and the first two games of the NCAA tournament. So there they are, one of four teams still standing, with as good a chance as any to win the NCAA title. If the Wolverines pull it off, it would be Michigan’s tenth national title – a record. It would also be their most unlikely. This week Pearson was named a finalist for the nation’s coach of the year. If he doesn’t win it, there should be a recount. I can’t recall March Madness starting with more mayhem. In the first round alone, the lower-seeded team pulled the upset in eight of 32 games – fully a quarter. 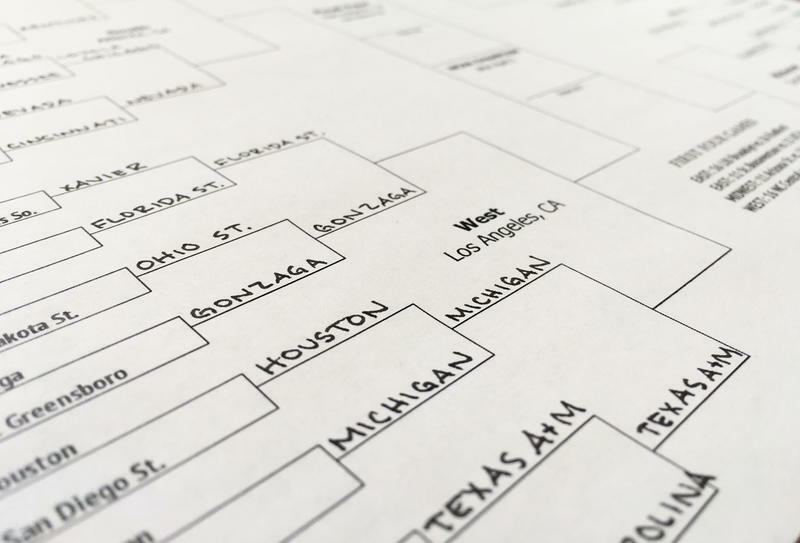 And it only got crazier in the second round, when six of 16 lower-seeded teams beat the favorite – which is fully … more than a quarter, I think. Stateside’s conversation with John U. Bacon, Michigan Radio sports commentator. Hazel Forrest died last week at the age of 106. According to The Chronicle Herald out of Nova Scotia, she was one of the last known survivors of the Halifax Explosion, which occurred when two ships, one loaded TNT and other explosives, collided in Halifax Harbour in 1917. It was the biggest man-made blast prior to the atomic bomb. Some 2,000 people were killed and many thousands more were injured. Yet, this cataclysmic event is largely forgotten, at least on the U.S. side of our border with Canada. On the court, Beilein looks good. Off the court, he looks even better. John U. Bacon for Friday, March 3. There are a lot of reasons to like the Big Ten basketball tournament this year – and perhaps more not to. What’s to like? The Big Ten can boast four of the nation’s top 15 teams, more than any other conference, including second-ranked Michigan State, and 15th-ranked Michigan. They’re all doing battle this week.